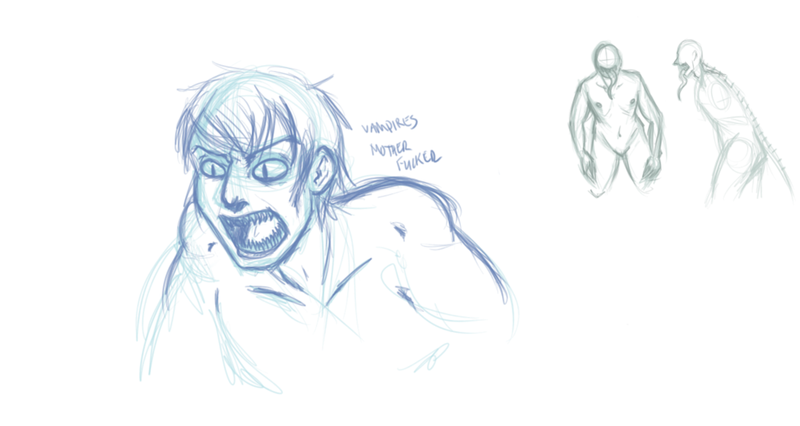 Some small concept sketches of a vampire and of a revenant, by Max. Vampires are more of a carnivorous race than blood drinking. They need to consume large amounts of protein and nutrients in blood. Their teeth have been almost completely replaced with canines, except for some of their molars for crushing the tougher bits of their prey.Blood replaces water in their bodies, giving their skin a reddish tint and turning the whites of their eyes completely red. Contrary to lore, the only ways to kill a vampire is by beheading and burning the entire body and salting the ashes. Garlic and holy items have no actual effect on them. Their eyes are constantly dilated, which is the only reason they avoid sunlight and bright lights. The smaller sketches in the background are body designs for the revenant, the first real monster we see in Dead. The basics with revenants are that they are vengeful undead/parasites that died violently after a betrayal of some sort. They rise from the dead to hunt down the person who betrayed them. More on them later.